Bewildered by the odd familiarity of unfamiliarity, I couldn’t take my eyes off him. 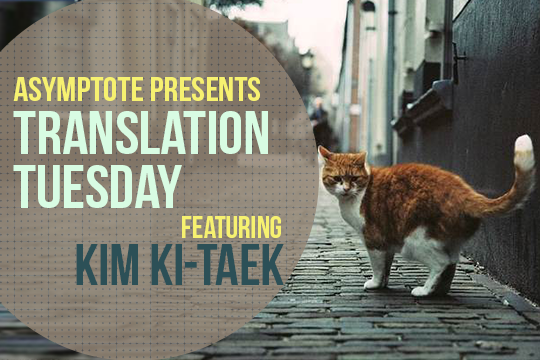 The award-winning poet Kim Ki-taek has been described as “an observer of minute and microscopic details” with a rational but compelling style of description that pulls you into his universe, where no encounter is ever mundane. The art critic John Berger, who gave us Ways of Seeing, would have found much to commend about the two poems presented below. My eyes met his for a moment. but I couldn’t remember who he was. He, too, seemed to ponder who I was. He was rummaging through a garbage bag. He was inside the skin of a cat. to walk with four feet appeared awkward. Meow, he let out with feeling. immediately he shut his mouth. He didn’t run away like other cats. and moved off into the distance for a long time.